Maria de Medeiros is the older of three daughters by the pianist, maestro and composer António Vitorino D'Almeida and Maria Armanda Esteves. 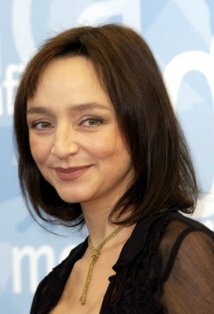 Her sisters are Inês de Medeiros, stage actress and film and stage director and Ana Medeiros, violinist, composer, and music teacher.Studied at Lycée Français Charles Le Pierre, Lisbon, and when she was 15 years old, she acted in her father's movie, Silvestre. Went to Paris in 1984, aiming to take a college degree in the Beaux Arts, and ended by taking Philosophy, and Drama instead, at the National Schools of Arts and Theatre Techniques.Lived and filmed in Portugal, and abroad, then she returned to Paris, where she is established since 1987. She married a Catalonian (Spain), and has two daughters. She acquired the French nationality because of her children, and because she has a French culture as well as a Portuguese one. She is fluent in Portuguese, French, English, German and Spanish.